Dit product van Blackfire moet nog in elkaar worden gezet. Hiervoor is houtlijm nodig. 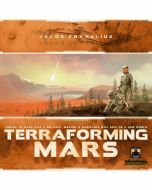 Terraforming Mars is an amazing game and with this Organizer you can enjoy it even more. The Blackfire TM-Organizer consists of 15 compartments to keep your game materials tidy and safe. There is one tray to hold all tokens, 5 small boxes for all player cubes, 2 ressource dispenser, 3 compartments for cities, vegetation and water and two big card boxes that can easily carry all cards in sleeves (there is even space for card expansions). The organizer is designed for fast access and immediate gameplay. Just place it at the table, prepare the ressource dispenser and start playing. The small boxes are closed by an acrylic lid so not cubes are falling out during transportation. A very special addition to this organizer are 5 acrylic overlays for the player boards. These keep all your cubes in place and avoid slipping materials. Glue is required to assemble the organizer. Detailed instructions are available.